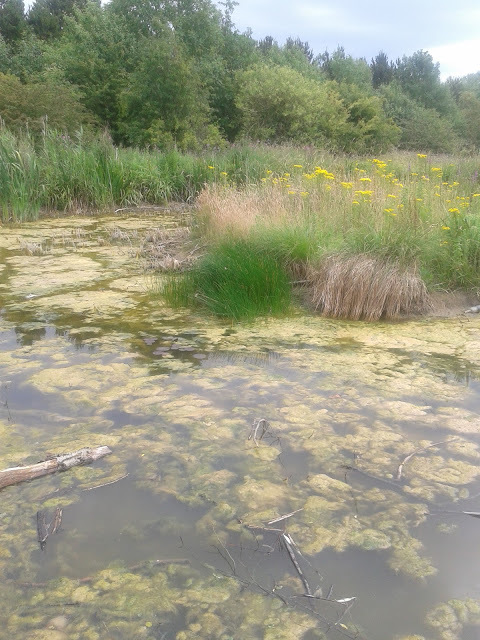 Spent yesterday walking for hours through a nature reserve with my daughter and best friend, Rising Sun Country Park, which is nearly on my doorstep and I have never visited! 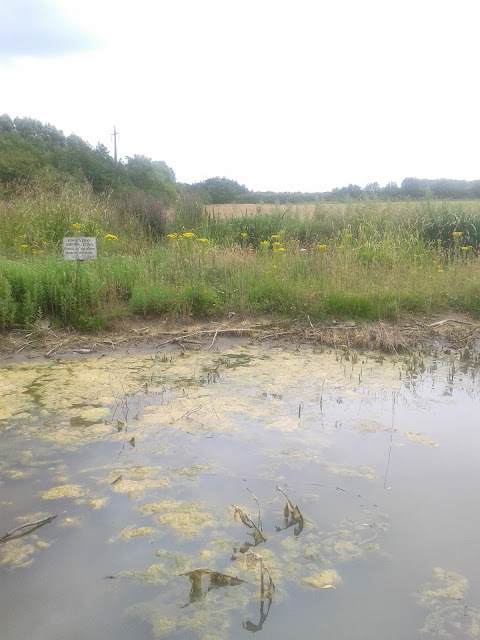 It is beautiful, lots of woodland, ponds and so peaceful and covers over 400 acres. 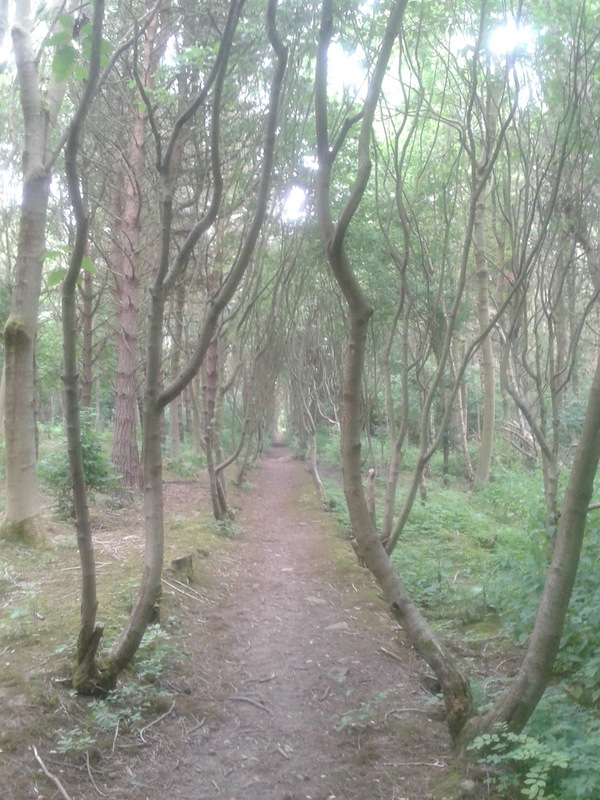 We found this passage of trees when we got lost :) but that's the beauty of walking somewhere new and eventually all paths lead you back to the main walks. It was eerily quiet and I wouldn't have wanted to walk there by myself but it was fascinating and magical. This tree from a distance looked to me like an old man hunched over but all three of us saw something else but as usual when you got up close it didn't look like anything but the bottom of the tree. 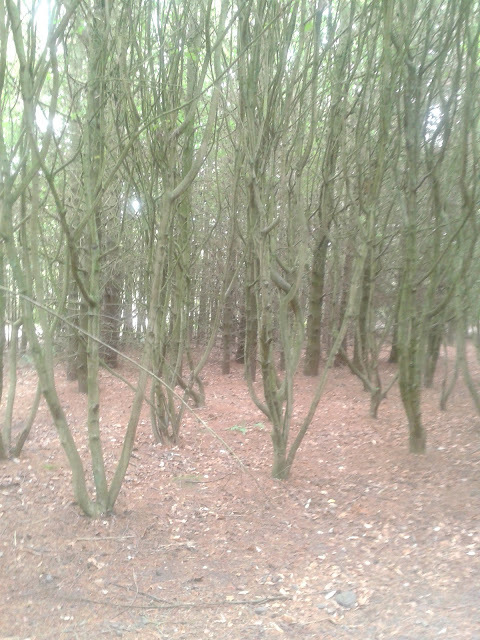 These trees fascinated me with their many intertwined branches and the unusual way they grew out of the ground. 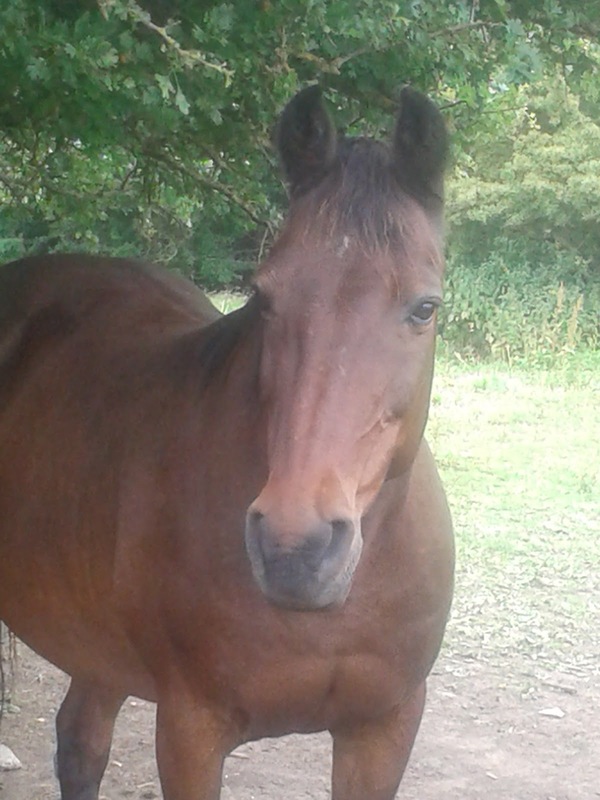 At the end of our walk we met this beautiful friendly horse who seemed to be just waiting for the many pats and cuddles he knew he would receive from the passing humans! Please read this wonderful lady's blog about infertility caused by medical negligence and how she is creating #Cuties to raise funds for IVF treatment. 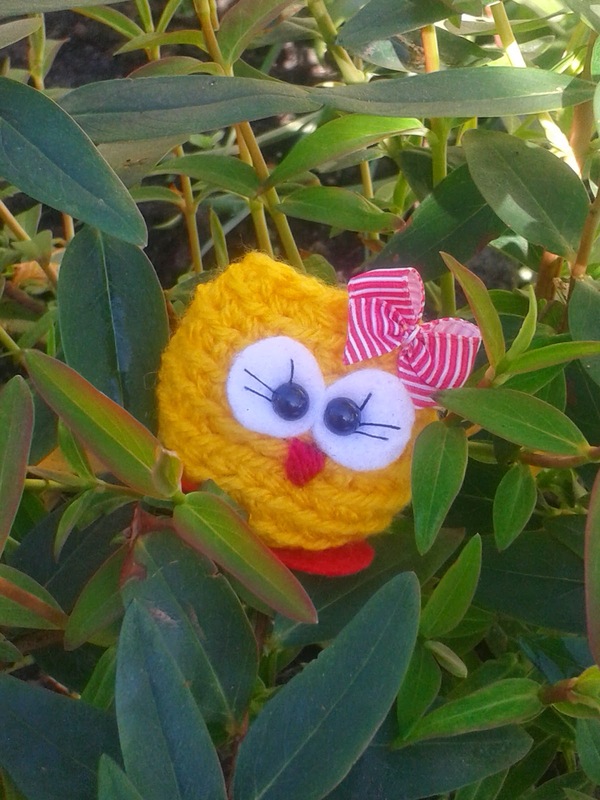 This is my #cutie Jacquelyn having a day out in the garden. 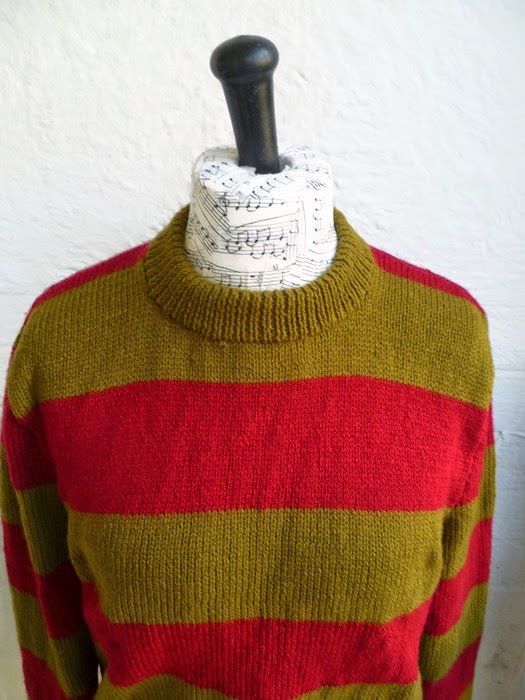 Completed the knitting of the first Freddy Kruger sweater from my custom order for two. It's from the New Nightmare movie part 7 now packaged and on it's way to the US. A little difficult to get a good photo as this is a size 44 inch chest on a 36 inch model so looks a little crumpled :( but it's not! I am on track to be shipping the next one by the end of the week. I hadn't realised that there were so many different versions of the sweater depending on which Freddy movie it is for. The stripe pattern is very precise and the size of the sweater determines the height of the stripes to ensure you have the exact pattern. Think I need to watch all the movies again! As it is raining and so cold I decided today was 'a sort out my stock' day which has taken hours, this photo shows a very small part of it. I always knew where everything was just it took a little longer to find it! Now back to knitting with a rather large latte and a strawberry cupcake. I hope everyone has had a chance to enjoy the sun this week. I managed to find time to sit and read my book in the garden and so glad I did as today it is back to being cold and raining again! I know it's good for the garden and my plants are loving it. 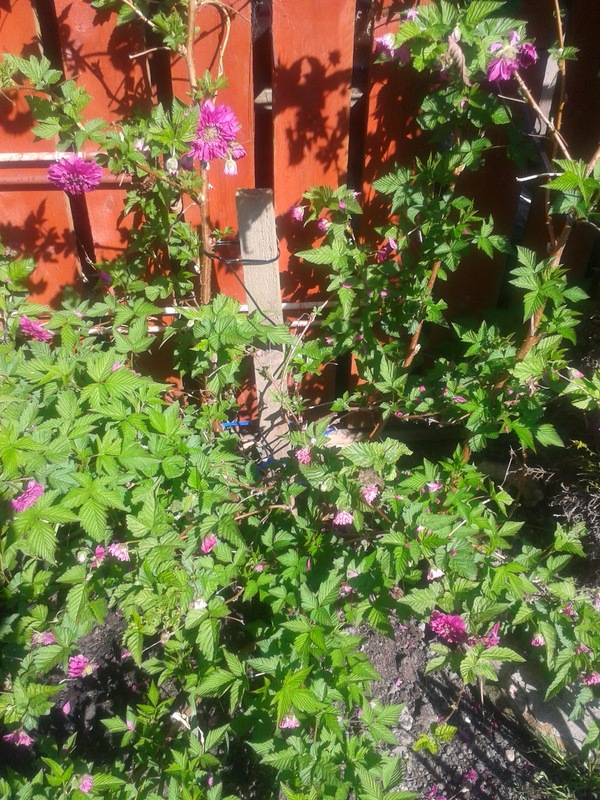 My clematis has gone from tiny buds to flowering in the last few days and it has hundreds of them. 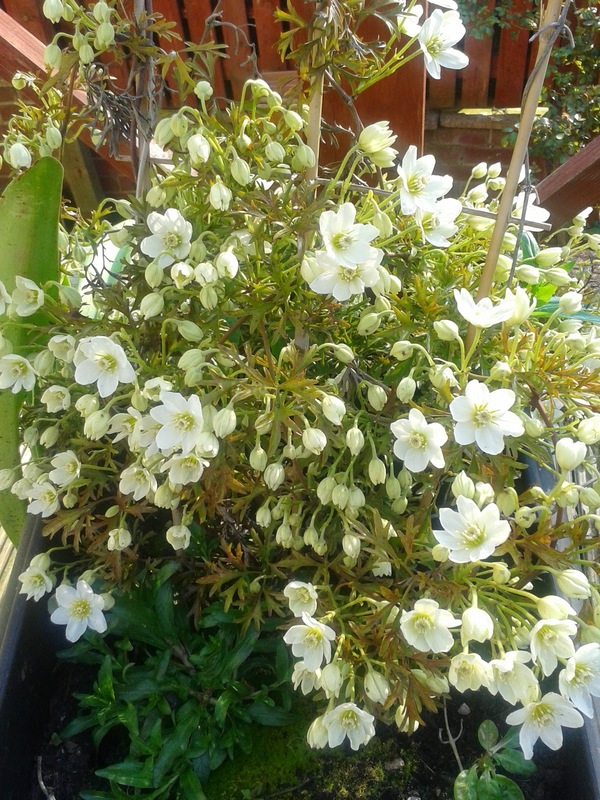 I have lots of fruit trees and bushes in the garden but unfortunately can't remember what berries this one will have but I love the flowers. 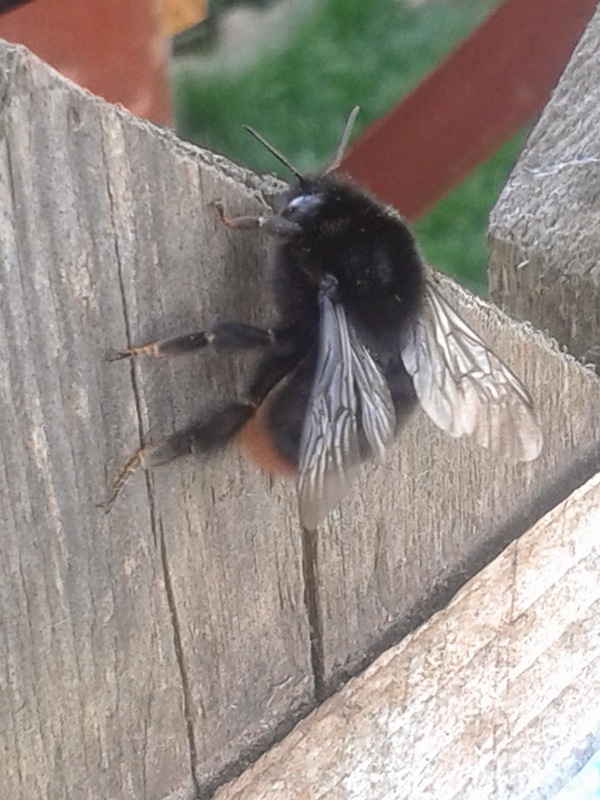 We have lots of flowers and plants to attract bees and insects and here is a very large bumble bee that decided to attach itself to my boot, I only knew this because Clifford, our dog, was running around my legs barking - he doesn't like bees - and I rescued it before he could get to it - all our animals are rescued :)He eventually flew off safe and sound. 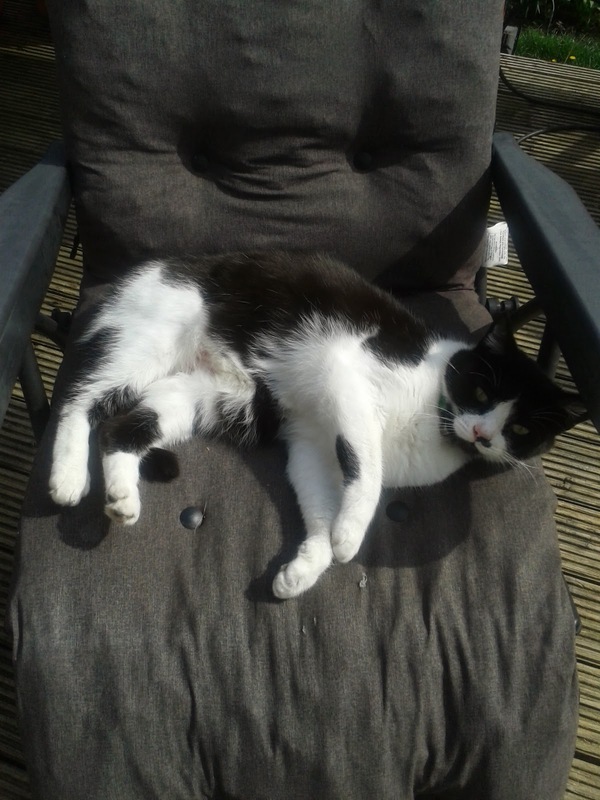 Missy also enjoyed the warm weather sleeping on my chair as soon as I wasn't in it. 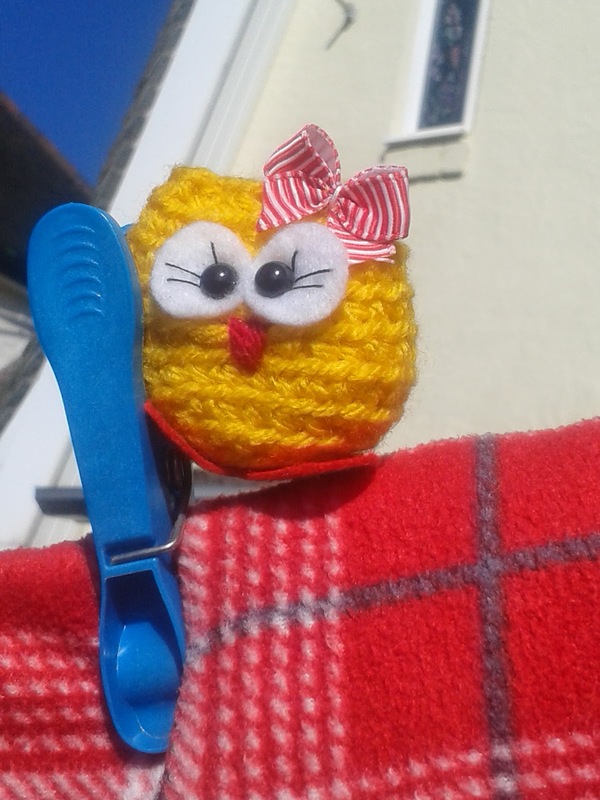 With the weather being so wonderful I managed to dry my washing outside with a little help from my Cutie friend Jacquelyn - created for me by Steffie MadeBySteffieB - here she is helping me. She had a little play in the garden after that! Today heating is on, staying inside and completing a custom order for two Freddy Kruger sweaters while watching Daredevil on Netflix! 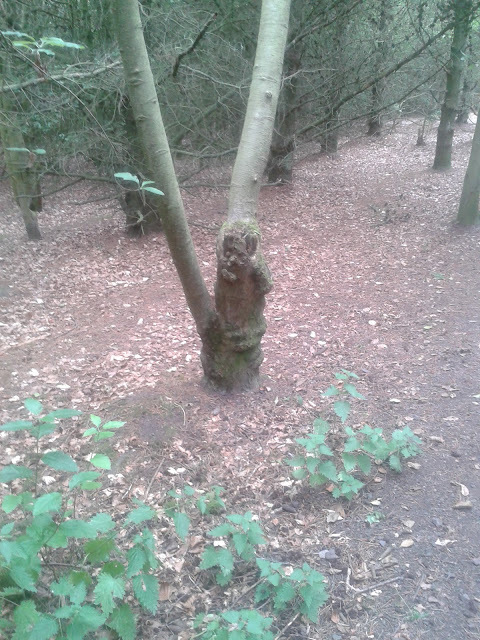 Have a great weekend everyone whatever the weather. Well today, for the first time, I lined one of my cabled knit hats with a satin lining. 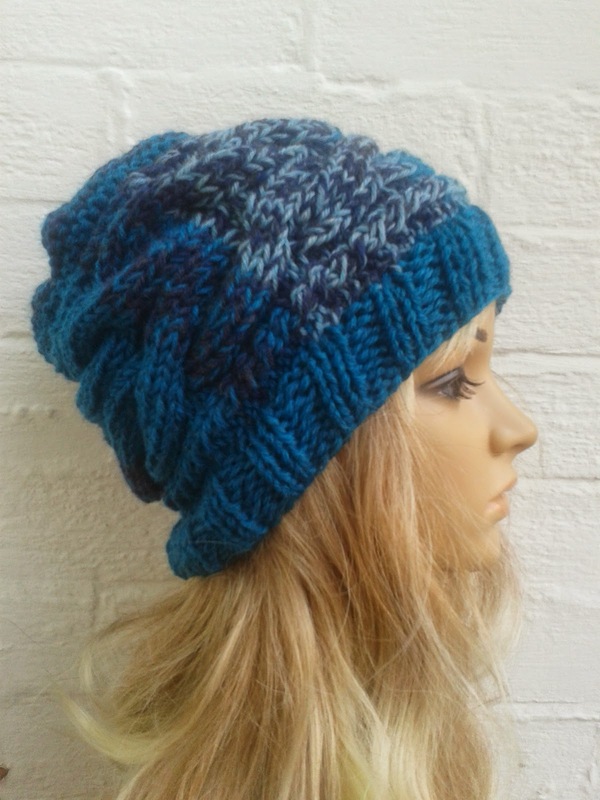 This was a custom request order as I hadn't realised that pure wool creates static on your hair and having it lined stops this from happening, you learn something new every day! Maybe I never noticed as my hair is so messy (intentionally) and full of product nothing gets through to it :). I haven't used my sewing machine for such a long time now - I used to make lots of clothes and soft furnishings but then life and knitting got in the way and I stopped but after making this today I think it's time I started again. After making sure the lining was wide enough - I added an extra 4 inches to the width ie hat will stretch to 24 inches - so cut the lining to 28 inches. I also added to 3 inches to the length as you only need approximately 3/4 inch top and bottom to turn under. That ensured there was plenty of room as satin lining does not stretch. 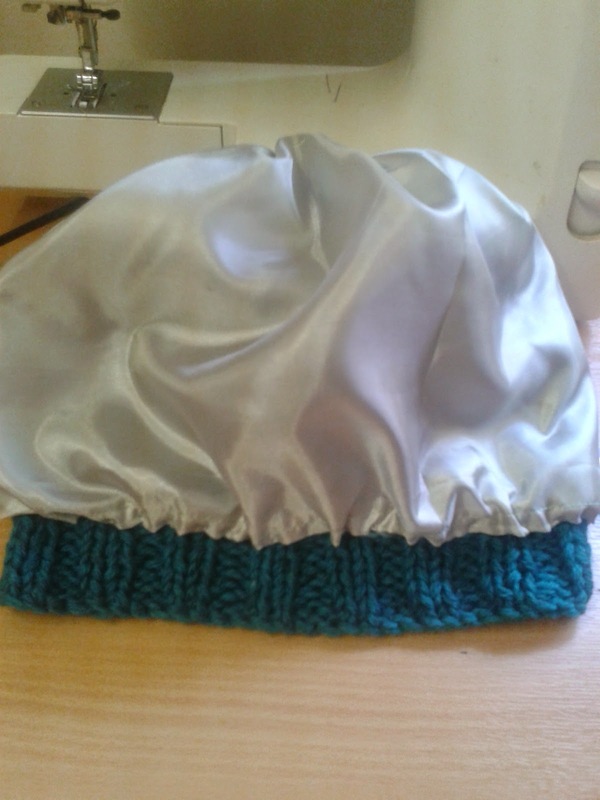 I also attached the lining to the top of the hat with a few stitches so that it can not slip around once on your head. Photo below is of the hat inside out with the lining. This is a photo of the hat completed. I had wondered about how to sew the lining to the hat to make sure it stretched enough with the hat when worn. I found this great blog post by Playinhookydesigns about using a mannequin head when stitching the lining to the hat, I know she was using a stretch fabric to line her hats with but the principal was the same and it worked. Sometimes the answer is staring you in the face, as my mannequin head is next to me in my office/craft room all the time! Now it's on it's way to it's new owner in time for Winter - it's always winter somewhere in the world :). Now should I go and sew or knit that is the question! We are having an Easter Give-away on Facebook. 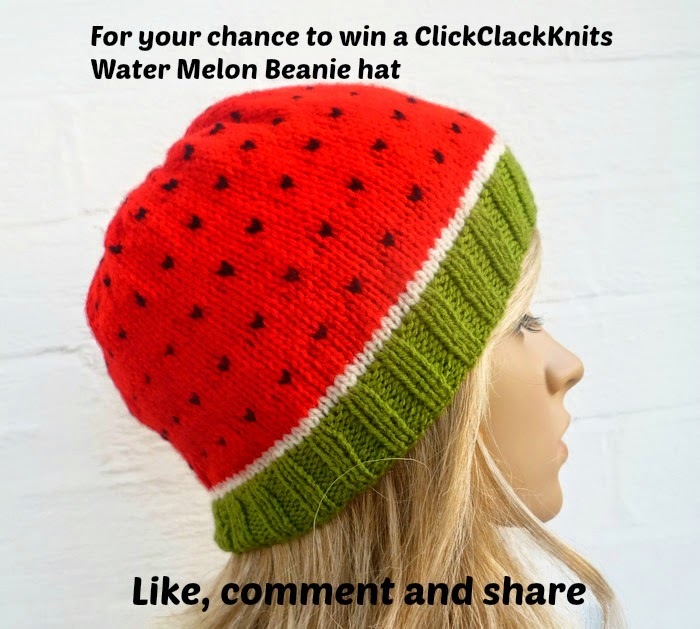 You can win one our fun Water Melon Fruit Beanie Hats. Like the post, share the post and comment saying what your favourite fruit is! The draw will close at midnight Tuesday 7 April. The winner will be announced on Wednesday 8 April. We have added a new Knitting pattern to our collection today. I have been intending to write more patterns for months now but then decide it's more fun to knit instead. Any sensible person would write the pattern as they are creating it but I usually start with the first 4 lines then get engrossed in the design part! So in order to write the pattern I have to have the finished hat beside me and write it from looking at the hat, certainly not the best way to do it! 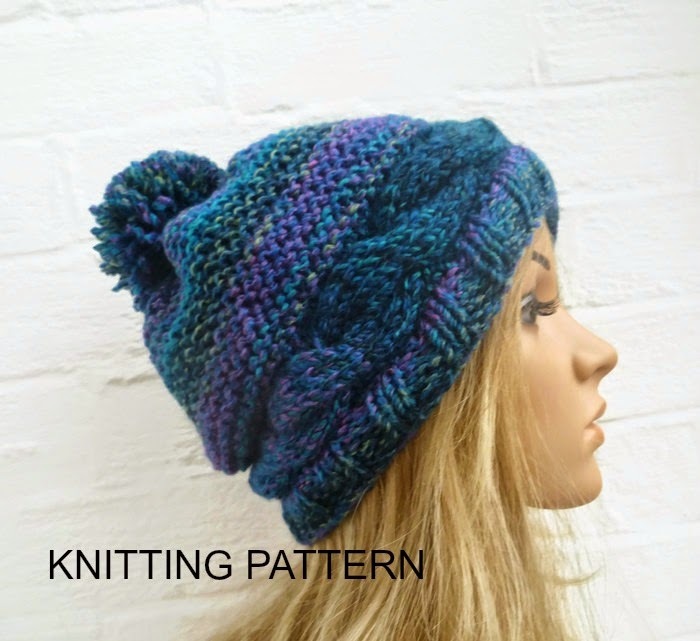 We have patterns for hats, fingerless gloves and headbands. I've promised myself over the next few weeks I will write more. Now I have to go and order more wool as a new design just popped into my head - here we go again :).